The DCL series is a low voltage, brushless motor control that operates in the 12-48 VDC power bandwidth, up to 30 amps peak (1 minute) or 15 amps continuously. The drive is a unique approach to motion control as the base DCL unit is designed for cost conscience OEMs. By removing many of the trim pots and jumpers associated with motor controls, the DCL saves cost on hardware and setup, but can be programmed by American Control Electronics for your specific application and motor. For users who wish to modify calibration in the field, the DCL uses programmer board CPC300-1 (sold separately) that snaps onto the unit and provides calibration of 10 different parameters, as well as DIP switches for setting different modes of operation. 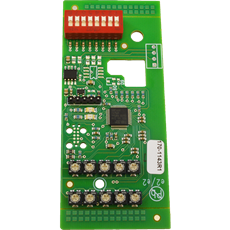 You only need one CPC300-1 as the adder board can be removed after programming and used with multiple DCL units. Base DCL units are Modbus capable and come with one trim pot for calibrating maximum speed, and two DIP switches for closed / open loop operation, as well as inverting the hall effect feedback.